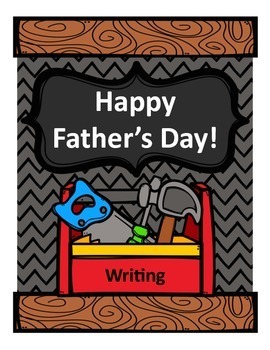 Here is a fun, meaningful Father's Day writing activity. Students can write about his or her dad, uncle, grandpa, or whoever they choose with the many versions included in this product. 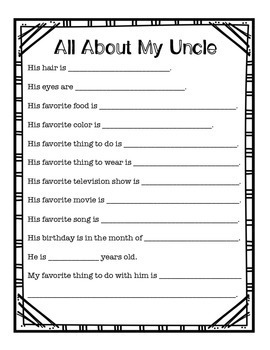 Format includes sentence stems to make it appropriate for younger grades. Connect this activity to the CCSS through a social studies writing activity during a unit of study on holidays/celebrations around the world. Could be a literacy center writing activity, or use it as a whole group. Students could even make one of those shirt and tie cards out of construction paper (there are instructions on how to do this on TPT from other sellers). 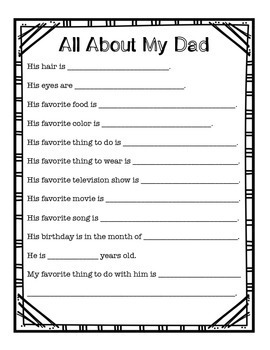 Then, glue this writing template on the inside. I did this with my students, and it turned out to look so neat! They were so excited to give their cards! Might need to shrink the size of the template first though to make it fit inside the card template. I had to shrink the size for the template and instructions we used.